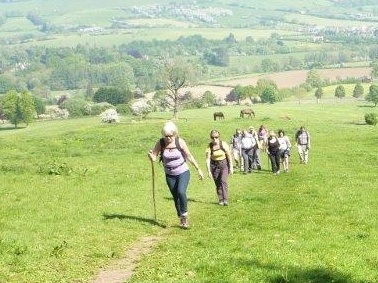 Talgarth Walking Festival is run by a group of enthusiastic volunteers under the nationwide organisation Walkers Are Welcome. Talgarth Walkers Are Welcome Group (TWAWG) is one of six similar groups in towns located within the Brecon Beacons National Park. Walkers are Welcome is a not for profit organisation that aims to do what it says “welcome walkers” by encouraging visitors to come to the area, by providing top quality information on local walks, by maintaining footpaths and signage in the district, by contributing to local tourism and regeneration and to promote the use of local transport. The new brochure for TWF 2019 is in the pipeline and should be out soon. So just to whet your appetites here are a few of the things to look out for. A visit to the Gwryne Fawr Reservoir, some ancient Yew trees, a story telling walk, a high level hike from Crickhowell, a gentle saunter to a weaver’s workshop, a barefoot experience, the reminiscences of a local MP and a fun film. The new updated Talgarth Walking Guide that the TWF has remastered is now available for free in Talgarth Information and Resource Centre and from Talgarth Mill. Seven diverse walks are featured (including two new ones), and the booklet comes with not only a detailed description of each one, but maps. Ranging from a gentle tour of the town (who knew there was so much history), to more challenging 8 milers.